It’s time for another awesome giveaway! The prize this time? CHIA SEEDS! WHOOHOO! 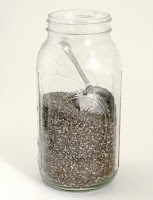 I will be drawing the name of 1 winner, who will receive a 2-pound bag of chia seeds (courtesy of Chia Seeds Direct). Chia seeds rock the house. Most of you already know I’m a big fan of these cute lil guys. 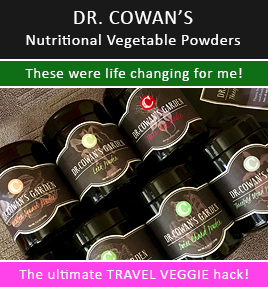 Read my post about chia here, the “Dieter’s Dream Food.” Chia seeds are being praised for many things including their fantastic nutrient profile, which proudly boasts iron, boron, essential fatty acids, fiber, and more. Add to that the claims that they may improve heart health, reduce blood pressure, stabilize blood sugar, help people lose weight from giving them extra stamina, energy, and curbing hunger, and you might become a fan of these little guys, too. They’re superstars in my house and we consume them on a regular basis. And… drumroll please…. chia pudding (like Holiday Chia Pudding! Have you made this yet?) It’s the best! Want the chance to win? It’s simple to participate! All you have to do is answer the following question in this post’s comment section. The contest will end Thursday night, February 4th @ 11:59pm. I’ll enter everyone’s name who answered the question into a drawing and announce the winner on my blog Friday, February 5th. *Please note: this month’s contest is only open to people living in the United States and Canada. Question: If you win these chia seeds, what is the first thing you want to make with them? Want another chance to win? Tweet a link to this blog post and come back to let me know in a separate comment. And… Want another chance to win? Facebook a link to this blog post and come back to let me know in a separate comment. Congratulations Courtney and Finding True Serenity!!! Your names were chosen as the winners of my 14th Awesome Giveaway. The prize: You will each receive a 3 pound bag of chia seeds, courtesy of Chia Seeds Direct – YAY!!!!!! Simply email me the address you want your prize mailed to. Finding True Serenity wrote, “Wonderful question! I honesty would have to name my #1 choice as WWF (World Wildlife Fund). My next Awesome Giveaway is in October, so check back for details! 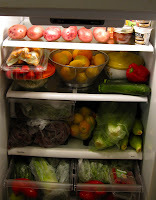 Here is a picture of my refrigerator loaded to the gills after we went to Whole Foods Market and the farmers’ market (where I’m a part of an awesome certified organic CSA). Most of the goodies are from the farmers’ market, but a few things I had to score from WFM such as kale, mustard greens, blueberries, raspberries, celery, cilantro, and parsley. Here is my light reading of the week… a couple of great magazines. VegNews and Purely Delicious. I’m also reading a book by Deepak Chopra, M.D. My goal is to spend time away from the computer for a few days because my right eye has been twitching for a week. It feels the most irritated when I’m working on my computer or using my iPhone, which I do ALL the time. Those two things must be the culprits because 1) I get PLENTY of sleep and 2) My body is full of any and all vitamins that if there was a deficiency it would cause that. Some could offer the suggestion that it’s stress, but my life is pretty calm for the most part in spite of my fertility adventures (will update you on that this week). And, again, once I start working on my iMac or look at the iPhone, my eye feels strained. We’ve been having 1-2 large green smoothies every day (I took a break from juicing this week – I like to change it up from time to time). Green smoothies (green shakes, green monsters – whatever you want to call them) are a staple in my life. They’re super easy to make and HELLO! they’re loaded with nutrition, fiber, and goodness. I topped this one with home grown sprouts for fun (see my video on how to grow your own sprouts here). Saturday night we had a birthday party to attend and I figured the restaurant probably wouldn’t have anything really healthy, so we filled up on this dish before we left the house. I made Raw zucchini/vegetable pasta medley with Lemon Basil Cashew Cream. It was refreshing and deliciously unique. (You’ll notice the “clump” of sauce in the center. I hadn’t stirred it into the dish when I took the picture. With raw pasta dishes it’s OK – even preferable – to have thick sauces because the water from the veggies helps to dilute it after it’s stirred together). I had chia seeds in my breakfasts a couple of days last week. More specifically, Sunny Morning Chia Porridge (no oats in this porridge though!). The mixture consisted of chia seeds, shredded unsweetened coconut, orange juice, cashews, stevia, almond extract, agave nectar, and cinnamon. It was just lightly sweet, making it ideal for my breakfast. And, full of energy of course! For dessert all week, I’ve been making different variations of raw banana ice cream. My husband LOVES this stuff. Seriously. 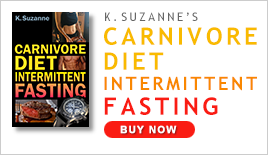 Every time I give him a dish of it, he swears… yes, literally swear words – like “Sh*t this rocks!” (he says other things, but I’ll keep this post “PG” rated), because he loves the stuff and is amazed at the texture and flavors. I like to make it in my food processor because it helps make it fluffy by incorporating more air (as opposed to making it in a blender or Green Star). Banana Ice Cream Crumble: I made a crumble of walnuts, raisins, shredded unsweetened coconut, and a pinch of Himalayan crystal salt. I put some crumble in the bottom of two bowls. Then, I pureed frozen bananas. I put the banana ice cream in the bowls and then topped them with more crumble. Yum! The various textures were awesome – smooth raw vegan ice cream, crunchy nuts, and chewy raisins. Today I froze 3 bunches of bananas for more Raw Banana Ice Cream. I also made a batch of my delicious soup, Kristen Suzanne’s Harvest Soup (Holiday Style with pumpkin spice added) – it’s fabulous, easy, and FULL of nutrients. Today’s batch was a tiny bit different than my original recipe. I didn’t have dates on hand so I used maple syrup. I could have used raw agave nectar, but opted for the maple syrup to support the holiday flavor theme of the soup. Later this week I’m going to make my lasagna and hummus recipes (these recipes are always huge hits with family and friends). I’m also going to make some dishes of uber simplicity such as chopped (or spiralized) zucchini/cucumber topped with a drizzle of olive oil (or diced avocado), Himalayan crystal salt, pepper, and a squeeze of citrus. And, some huge salads are in order. Well, I ended up having quite the chocolate craving tonight with nothing in the house stashed away for a rainy day. But, I didn’t wear a frown for long. I grabbed my Chocolate Recipe book and turned to the Chocolate Crunch Hazelnut Macaroons (recipe here) and in less than 15 minutes I was a smiling girl. Chocolate covered fingers and all. Shortly after that… I was craving GREEN JUICE! So, I busted out my GreenStar (my favorite way to juice these days) and made about 10 cups of juice (I gave my husband 2 cups, I drank a quart, then we went on a 2 mile walk at 3:30 am and I’m now home updating this post while drinking the remaining quart of green juice). What was in it? So many good things. I’m calling it Army Green Juice (because the color was truly army green and gorgeous!). The recipe: 2 red bell peppers, 1/2 lemon, 1 orange peeled, 1 large cucumber, 1 medium cucumber, 1/3 bunch Italian parsley, 2 large heads of Romaine lettuce (my first time juicing Romaine, Mr. Monarch and Ms. Stokes-Monarch inspired me), 8 medium carrots, and 4 leaves of mustard greens. YUM!!! I’m full of RAW VITALITY!! !